Don’t step on the crack or you’ll break your Teddy’s back! ? Good morning folks! Yesterday I had the opportunity to spend the day with my brother Nathan Arizona at the Heard Native American Art Show in downtown Phoenix, AZ. We got to meet several new native artists and visit with old friends. We have our mining company Earthtone Trading to thank for this opportunity. We hauled down from Utah two tons of our Mohave Brown Alabaster to sell to the talented sculptors. We arrived to the show late and ended up taking a long time finding a parking spot. We finally found an open spot large enough for our truck in the basement of a parking garage. We walked the show and talked with folks and then I headed back to the truck to get some flyers and take a break. I was trying to think of a good spot for Lego photography and I am always amazed at the simply mundane areas that make my shots come to life. The shot of Mr. Bean above with Teddy was not the shot I intended to take. It was a gradual process from the start of looking for the right spot with some rails in the parking garage basement. The rails made for some great bokeh and contrast. I really liked where these shots were taking me so I continued to enjoy the creative process and setup different angles. It was a bit tricky to get the depth I wanted on the right and still show enough of Mr. Bean on the left. I also decided the shot looked much better in black and white. After composing a few shots I decided to try it from the other side by sticking my camera through the bars. Luckily I have a tilt screen on my Olympus OMD EM5, so I was still able to compose the shot without having to hike around to the outside. Mr. Bean strolling on the outside. This is when I noticed the striking crack on the concrete and an idea popped into my head. I was so excited to have stumbled upon this idea! I had to balance Mr. Bean just right – the umbrella and the teddy were the counterweights. It took some patience to get it just right and luckily there was no wind at all. Even a slight breeze would have toppled Bean and mad enough this shot impossible. So the heavens aligned and I was able to capture these images! Mr. Bean has a somewhat childish outlook in certain ways and that why I find him so humorous. He takes the moment like a child would. I felt this image conveyed what I used to feel about cracks on the ground. The old adage “don’t step on the crack or you’ll break your mothers back” seemed like the perfect title with a bit of a change to put what Mr. Bean cares about most. 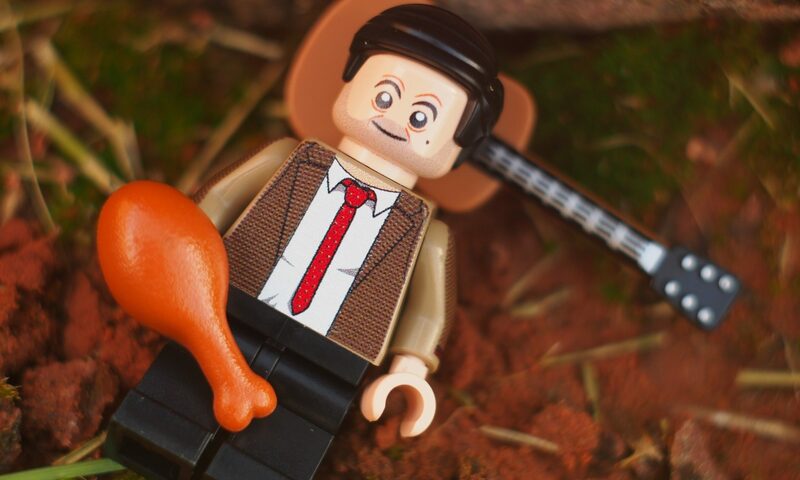 Thanks to Minifigures.com for making a great custom figure Mr. Bean. via Instagram http://ift.tt/2mqQB82 Sunshine Truckstop, Summit, UT. via Instagram http://ift.tt/2m31NFa Being followed/stalked by a lone mountain lion is something Jim has become accustomed to, it is a reason he keeps his walking stick ready. Spring Creek Canyon in southern Utah has some spots that never see the sun in the bottom because of the high 800 foot plus cliffs of redrock. The canyon at its narrow point is only about 30 feet wide. At the base of the cliffs one can find alcoves full of small animal bones. Mountain lions are prevalent in the area. via Instagram http://ift.tt/2lhAEkL February was a great month! I got to learn some new techniques with lighting and reflections thanks to the monthly challenge by @_toyphotographers_ on Google+! Thank you to @xxsjc @reiterlied @bruce.the.spaceman @pixijoflo @ballou34 for the tags! I’ve tagged a few more of you. If you didn’t get tagged – consider yourself tagged!